Hectopascals & Millibars are they different? Hectopascals? What is wrong with the millibar, or even the old inches or millimetres of mercury? In more recent times, one bar has been defined as a near average total atmospheric pressure, divided, for convenience into 1000 millibars (mb). By international scientific convention and agreement, most scientific units are named after famous scientists in the relevant field. We have long used Volts, Amperes, Ohms, Watts, Joules, Hertz, Curies Celsius, Fahrenheit and so on. The exceptions are the basic units of length, mass and time, ie the metre, gramme and second. Following the adoption of the Pascal as the SI unit of pressure, meteorologists chose the hectopascal as the international unit for measuring atmospheric pressure. (1 hPa = 100 Pascals = 1 mb.) The millibar is still often used in weather reports and forecasts for the public, but the term hectopascal is increasingly being used, especially on the Continent in general and France, in particular. After all, Pascal was a Frenchman!. For those with old instruments, conversion scales from mb/hPa to inches and millimetres of mercury will be found in almanacs eg Reeds. 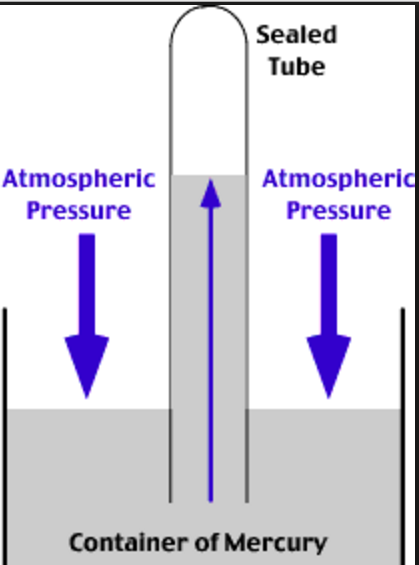 The distribution of pressure is vital information for the meteorologist who needs pressure readings taken at the same time in many different places. For consistency, readings are adjusted to a datum of mean sea level to take account of the reduced pressure at places above sea level (1 hPa at or near sea level equals approximately 7.5 metres or 25 feet in height). From these readings a pressure chart can be produced by drawing isobars (lines that connect places with equal atmospheric pressure). Isobars are usually drawn either side of 1000 mb or hPa at equal intervals, typically 2, 4 or 8 hPa, depending upon the chart scale. Areas of high (anticyclones) and low (depressions) pressure can thus be readily identified. Pressure readings give the yachtsman valuable information and assist in monitoring weather changes and forecasts. Changes in pressure, particularly if rapid, are often of most importance, but it is useful to compare the change of pressure at one's own location with that expected from any forecasts charts received.